Dirt bike hitch carriers are a great alternative to pickup truck beds or tow-behind trailers for transporting your dirt bike. They're low enough to the ground to make loading and unloading easy, they're less expensive than a trailer (not to mention easier to maneuver), and there are no DMV registration fees. The first step before buying a motorcycle hauler of any kind is to make sure your hitch is rated properly. We won't go into detail about that in this article but it's important, especially if you choose the MotoTote or VersaHaul carrier which allows you to tow a trailer behind your dirt bike. Most dirt bike hitch carriers require a Class III hitch or better, and you need to check your vehicle's tow hitch tongue weight (tongue weight is the downward force on the hitch), especially if your vehicle is a car or mini-SUV. The towing capacity info should be in your owner's manual but if you bought the vehicle used and the hitch was already installed, you might need to do a search for the tongue weight. Try 'towing capacity and tongue weight (your vehicle)' as a search term or maybe try the U-Haul website. Using a 2017 Chevy Trax at U-Haul, it comes up as a Class II hitch, max weight 3,500 pounds, trailer weight capacity 3,500 pounds, and tongue weight capacity 300 pounds, which pretty much knocks it out of the running for any of the three hitch haulers listed because they all need a Class III hitch. Don't forget to include the weight of the hitch hauler with the weight of the dirt bike in your calculation. If you need more info about hitches, some brand names are Reese and Curt Manufacturing. Curt Manufacturing has a good 'Understanding Towing' pdf article that offers tips about towing and trailer hitches. The three ramp-style dirt bike hitch haulers that follow are organized based on list price (MSRP), but the Internet price is almost always lower. The Black Widow Aluminum Motorcycle Carrier ($159 list price) is one of the lightest and cheapest dirt bike hitch haulers you'll find on the market. 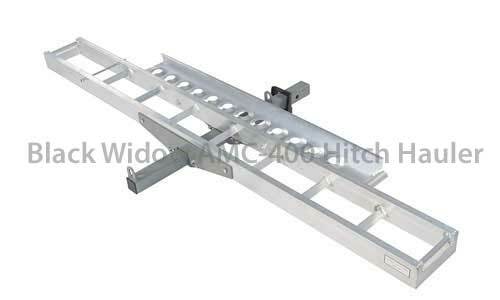 The AMC 400 hitch carrier (Amazon) is made of aluminum, can carry up to 400 pounds, needs a Class III or better 2" receiver, and weighs 36.5 pounds so it's easy for one person to install into the hitch receiver. The loading ramp can be used on either side of the carrier, and the ramp can be stored on the carrier when not in use. The carrier's track measures 75" long with 6.75" rung spacing, includes a 45.5" loading ramp, and has a spacer bar adapter for transporting smaller dirt bikes. The distance from the center of the hitch pin to the center of the track is 18 3/8 inches. The hitch hauler is runged which helps with stability, but can make it difficult to get the bike on and off the carrier by yourself, especially if you're a bit on the short side or your vehicle is on the tall side. The hitch carrier comes with a one year warranty. There's no doubt the Black Widow dirt bike carrier is a popular choice, but some of that popularity stems from the price and its light weight, not necessarily from the quality. There are lots of reviews, but most of the reviews at Discount Ramps are only one or two sentences so they're not as helpful as the reviews on Amazon. The Amazon reviews are where you'll read about the need for getting lock washers for the wing nuts that hold the ramp to the carrier, as well as for the anti-wobble attachment because they'll work their way loose - not a good thing for you, your bike, or the guy behind you. A few of the owners simply upgraded the bolts and related hardware instead of using lock washers just to be on the safe side. And the Amazon page also has almost a hundred answered questions so in addition to the reviews, the Amazon Q&A and would be worth a quick read. The Black Widow is also available as a double hitch carrier (Amazon) that weighs 82 pounds and has a list price of $305. The single hitch carrier is pictured below. 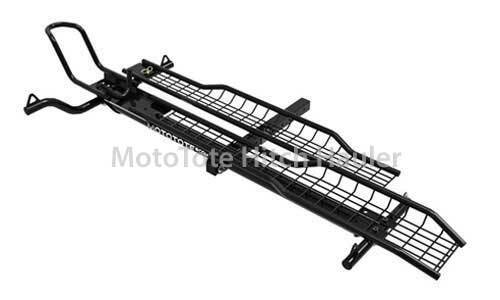 MotoTote has been manufacturing their MotoTote motorcycle carriers since 1997 and their dirt bike hitch carrier is the MotoTote MTX M3 (list price $499) which has a weight capacity of 500 pounds. The MTX M3 weighs 58 pounds so installing it is usually a one-person operation, and you only need two wrenches for the install. A class III or better hitch is required. The ramp length is 57 inches which makes it easier to load and unload your bike because the longer length lowers the angle of the ramp. The ramp stows on the MotoTote carrier using quick disconnect hardware, and the ramp can be assembled for left or right loading. The distance from the hitch pin to the center of the dirt bike is adjustable to a distance of 20 inches which is good for those with rear-mounted spare tires. MotoTote utilizes their Zero-Wobble bolt to tighten the connection point of the carrier with the receiver to eliminate any rocking of the MotoTote carrier. If you're prone to losing things, order an extra bolt because the MotoTote won't work properly without it. There's a class II receiver on the end of the carrier for a small hitch ball, so you can tow a (very) lightweight trailer behind your dirt bike. Check the MotoTote site for towing limitations if you plan to tow a trailer in addition to your dirt bike. The MotoTote MTX M3 comes with a one year warranty. There are two optional light kits with brake, turn signal, and taillight functions that connect to your vehicle's lighting system via a standard four-way connector. The light kits are made in the USA and they're specially designed to fit the MotoTote hitch carrier. The LED light kit is only available on the MotoTote website (list $113), but the regular light kit (list $82) is also available on Amazon. The MotoTote hitch carriers are conceived, designed, developed, and marketed in the USA, but the actual fabrication of the carrier is done in China. Although the MotoTote hitch carrier is available on Amazon, the MotoTote website has way more answered questions and helpful reviews. But with a $499 list price, it's still a good idea to check the current price on Amazon for comparison before buying. The VersaHaul dirt bike hitch carrier (list price $532) has been around a long time and is a quality hitch hauler with a proven track record. There are two basic single carrier models - the VH-55RO (Ramp Option) and the VH-55, which doesn't come with a ramp and has a list price of $429, so if the price is really cheap, make sure the one you're buying comes with a ramp. The ramp is available separately for $101 on the VersaHaul site. The VersaHaul hitch hauler has a 500 pound capacity, is made in the USA, and is made of 14 gauge steel which makes it very sturdy and durable, but also makes it a bit heavy at 94 pounds. There's an adjustable wheel stop to accommodate a wide range of bike sizes, and the ramps are reversible so you can load your dirt bike from either side. This is great for those with offset spare tires or who carry ladders on their vehicles and don't want to get whacked in the head every time they load the bike. The ramp attaches to the carrier when not in use. The VH-55RO has retractable and adjustable tie-down bars that allow you to align the tie-down straps with the bike's suspension, relieving some stress on the suspension, Also, the tiedown arms slide into the main channel via locking pins when not in use, keeping the footprint of the empty hitch hauler more compact. The VersaHaul comes with a one year warranty. The VersaHaul has a Class III hitch at the end of the carrier which means you can haul trailers up to 3,000 pounds behind your dirt bike. The VersaHaul website says the maximum towing weight, regardless of your vehicle, is 3000 pounds. There's an optional trailer light kit (list $65) that's designed specifically for the VH-55 but like the hitch carrier, you can't buy it from the VersaHaul site although it is available on Amazon. There's quite a bit of info throughout the VersaHaul website but there aren't any reviews or Q&A, most likely because you can't buy directly from VersaHaul. Luckily, there are quite a few VersaHaul reviews on Amazon along with several Q&A, so it's a good idea to read through the reviews or questions, and if the answer you need isn't there you can always ask your own question. These three ramp-style hitch haulers have been around for a while and have a good amount of reviews and feedback. As long as you adhere to the manufacturer's specs and any limitations, you shouldn't have any problems.